I just found the change more accurate to the content of the sheets, but if it's good now then that's fine! You're certainly not wrong but while more descriptive, I find it less friendly, so to speak. If anyone else disagrees and thinks it should be changed though, do let me know. And either way, thanks for pointing it out! As for the emoji issue, I see what's wrong and am in the process of adding in support. It's a bit tedious and will take me a little while but it probably should be ready in an hour or two. Edit: Updates are done and all text entry on the main sites should now properly handle emoji. That said, please don't overuse them. I was looking for Sonic The Fighters when only 3 games popped up for all Arcade games. There were more games here right? Edit: Just did a quick Google search for the Sonic The Fighters models clicking the link brought me to "game not found". This one isn't an error. It was discovered that all of the models submitted to that section as rips had been heavily modified (and relatively poorly at that) and as a result, the game was deleted. If anyone would like to re-rip it properly though, it's welcome to return. ^ What Petie said. All of the models there were using textures that were either scaled way down (Robotnik's glasses were one 44x17 texture instead of two 128x64 images), some models didn't even have their correct parts (Amy used Sonic's mouth textures and Nack had recoloured Sonic hands, giving him five fingers instead of four), and some weren't even using textures from the right game (Sonic's shoe buckle was taken from his Sonic Adventure DX model!). So yeah, game got nuked for having incorrect rips. Ok that makes sense, what about the rest of the Arcade games? Same issues of inaccurate rips? What else is missing? I only know about the one that was deleted the other day. (01-07-2019, 11:49 AM)Petie Wrote: What else is missing? I only know about the one that was deleted the other day. Nevermind, nothing else was missing. Having personally messed with Sonic the Fighters data for about a decade now, I can say that the Sonic the Fighters models are handled a little different than most traditional gaming engines. However, with the recent discovery of debug mode, it may be possible to find and decode the routines used to draw model data within the game and translate that data into something usable in something like Blender. There isn't a whole lot of motivation on my end to actually go through with this, as it would be incredibly tedious and meticulous work to translate the game data. I'm not sure what would give me the proper motivation to rip the models, but it does indeed seem more possible than it did a decade ago when the nebulam2b emulator was first being developed. It had always been my running theory that the existing model rips were from Shenmue's toy capsules. 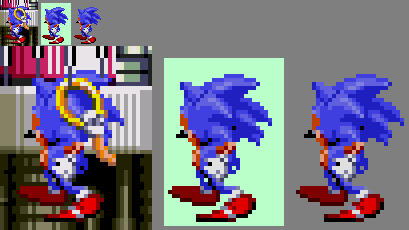 Hi, I think I may have found an error in the Sonic Crackers' Sonic sheet, in one of the sprites for his Dizzy animation? One of my screenshots from in-game is on the left, the Spriters Resource sprite is in the middle, and other site's sprite is on the right. 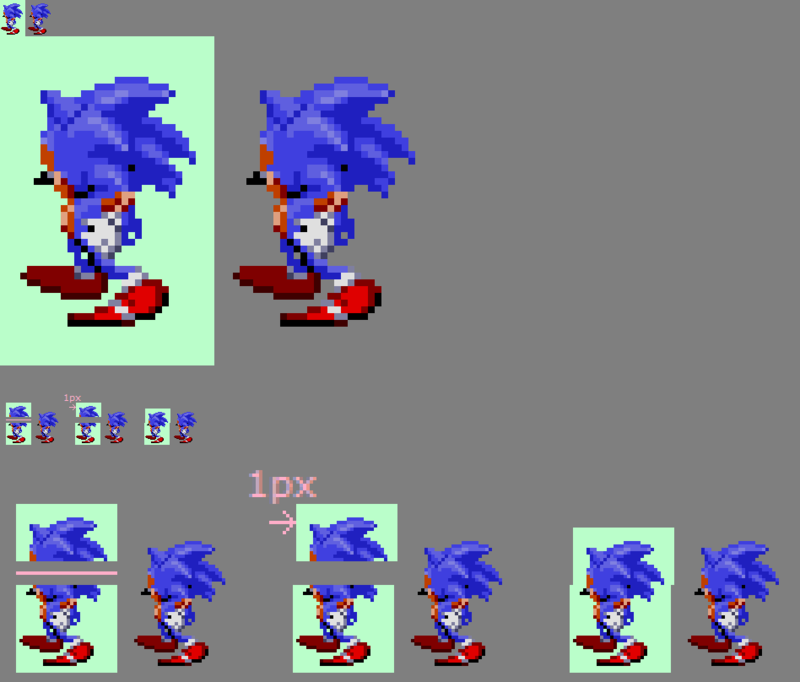 The screenshot and the other site's sprite have the same Sonic head, while the Spriters Resource head is different. Though I think the SR's version actually looks better. Is there something about emulators that would make them display part of a sprite shifted over by a pixel? Sorry if the sheet's current sprite is actually correct, or if this is the wrong place to post this. Nepgear's Christmas costume was supposed to go under "Characters". I'm having session errors on my iPad and iPhone. I try logging in to the Models, Sounds and Spriters Resources, but it still doesn't show that I have logged in. The Textures Resource, it does show. Can this issue be resolved, please? It's not an issue with the site. Clear your cookies for all five *-resource.com site and try again.